One of the most frequent used menus in the beginning of the round. It shows what you can build or research with your current status. Choose a building, ship, research or defence submenu. After you make your choice, find the picture of the feature you are interested. E.g. with a research: The game does not allow you to research Hyper speed systems. Finding the picture in the list shows you that the requirements are not completed. You have two “green” – i.e. completed and one “red” – i.e. incomplete. To find the missing requirement, point the mouse cursor over the “red” picture and a tooltip will show you what you miss. 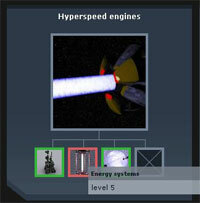 In the example we used this is Energy systems level 5. If you can’t see the tooltip, reload the page or use Back and Forward browser buttons. 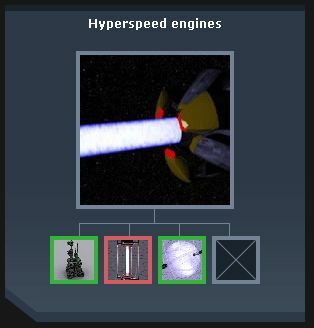 If you covered all shipbuilding requirements, your menu will look like that. Although the presence of all ships, you can build only the special ship of your chosen race.